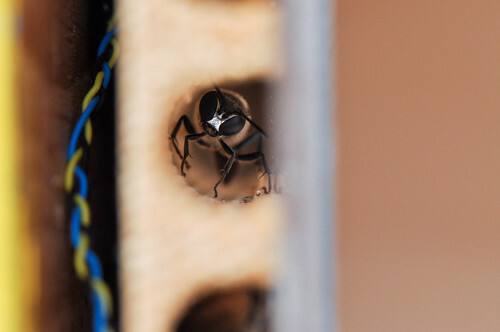 Build your own bee dream home for solitary-nesting native bees and wasps. Engage your design savvy, non-linear leanings, craftsmanship and playful spirit. B-friend your local pollinators! What: Build creative ‘condos’ (‘hotels’) for all species of wild, solitary bees and wasps which are mostly native to Canada or wherever you live. Post your photos of them to our web gallery exhibits (more on that below). Why: To cultivate our understanding of bee and wasp biodiversity, of their roles in ecosystems and agriculture and of how ecosystems support solitaries. We’re not especially helping solitary bees and wasps by making hotels, but our hotels can inspire us to cultivate landscapes which self-generate structures found in nature so that they may thrive. 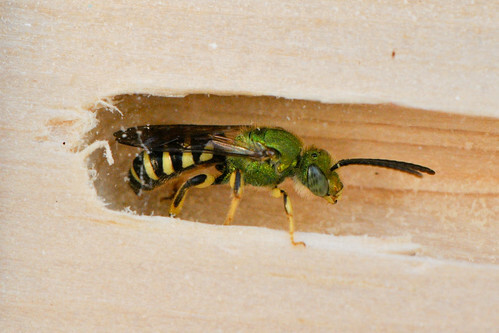 Solitary bees and wasps make great pets, too! When: Your abodes can be placed outdoors anytime and will be inhabited by your local solitaries between Spring and the end of Fall. Leave them outside in Winter. Where: Your condo can go anywhere. Really, solitary bees are everywhere, and they’re gentle (more below on stings). Put your dream home in your yard, neighborhood, community garden, school, green space, rooftop, balcony or park. Read the DIY pdf above for important details. Photos: If you’re in Canada post your bee condo photos to Solitary Dream Homes Flickr photo stream via email (how-to info below). We’ll add them to Hymenopteran Housing Project global Flickr group. If you’re outside of Canada please post your bee houses at Hymenopteran Housing Project global Flickr group for flickr members (Flickr is free). Above: your bee house in action – on the inside. 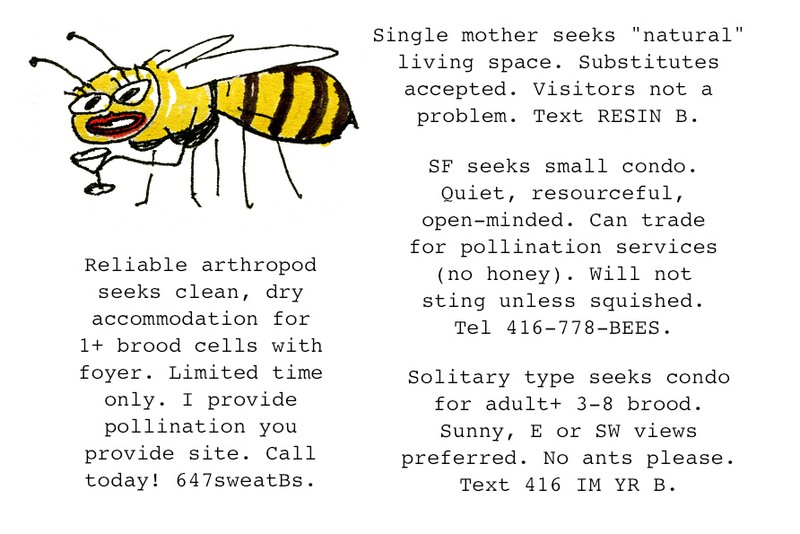 Odes to Solitary Bees video-poems has more, avec poetry. (Video: Stephen Humphrey). We came to look at the apartment. 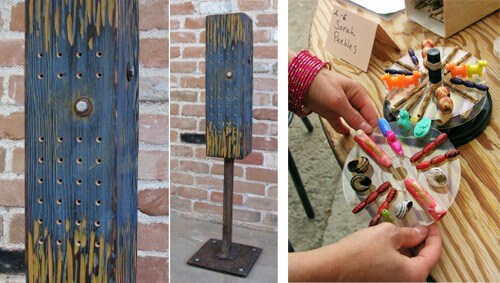 Create a unique “bee condo” (a/k/a “bee hotel”), sculpture or other habitat structure for wild, solitary-dwelling bees and wasps. Also known as tunnel-nesting bees, these bees are different from honey bees, carpenter bees and bumble bees. Solitary wasps are key to natural insect control, and are different from their social cousins (more below on biology). Why not make your dream home cater to the many different kinds of solitaries living around us? After all, about a third of Canada’s 800 species of bees are twig and cavity-nesters! 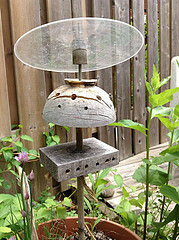 Read the Easy DIY Bee Condos (Bee Hotels) PDF for details. Your creation can be simple, complex, or something in between. Make it compelling, inventive and functional. 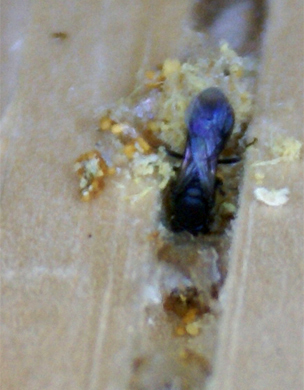 Solitary bees will take to it wherever there is ample sunlight and nearby pollen, including flowering trees. SAFETY? Solitary bees and solitary wasps are not social insects, and are unlikely to sting you! Check out these bee biology illustrations and “Essential Facts about Canada’s Native Bees and Wasps” (below) to understand why solitary bees do not live in groups, do not make honey or wax, or mind if you watch their nesting activities – even up close. LOCAL!! 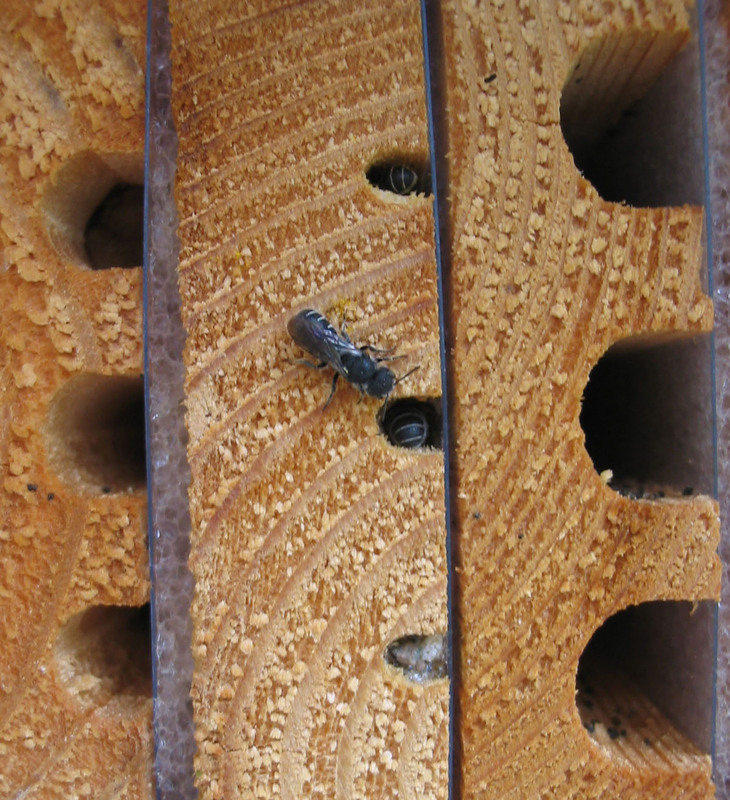 Do not order solitary bees online or move your bee homes far from their origin. Although this is common agricultural practice, pathogen spread and competition among introduced bee and wasp species – and the parasites, fungi and other biota that accompany them – are vital concerns around the world. Cultivating our local pollinators and insect controllers – especially through creating and maintaining habitat –makes for robust ecosystems. The subject will be the title, and, Flickr is smart enough to see the words “Tags: tag1 tag2” etc. at the end of the title and make those into tags (so you could even add your own tags that way). What you put in the body of your email will be the caption of the photo. NOTE: your email address will not be will not be displayed on Flickr or even saved — this is just a way for anybody to upload to Flickr (you don’t have to be a Flickr member to do this!). Bee abodes emailed to our web gallery must accomodate a wide range of solitary bee species, not just mason bees (see DIY guidelines). Sorry – we don’t have the people-power to answer your questions. Please direct any questions you may have to either the “Hymenopteran Housing Projects” discussion group, xerces.org or pollinator.org. You REALLY SHOULD check out these pages on this site…. 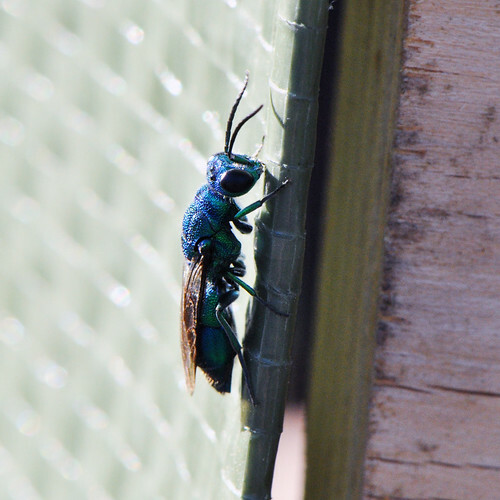 Cuckoo Wasp hopes to sneak into other solitary wasps’ nests. See our cleptoparasite bee trading card #18, and this related video. Male ground dwelling bees of the genus Agapostemon find new napping spots. See related video. Solitary mud dauber wasps (Trypoxylon metatarsus) make an intense Jimmy Hendrix-like sound while they packed in stunned garden spiders and seal cells with mud. Watch and listen up close in related video. Fruit flies? Certainly not! Small sweat bees from the Hyleaus group.